The Remote Grease fittings on StingRay Aqueous Parts Washers simplify the necessary maintenance. The StingRay automatic lubrication system ensures critical bearings are properly lubricated on a regular basis. Enables manual rinsing of spot areas after a wash cycle. 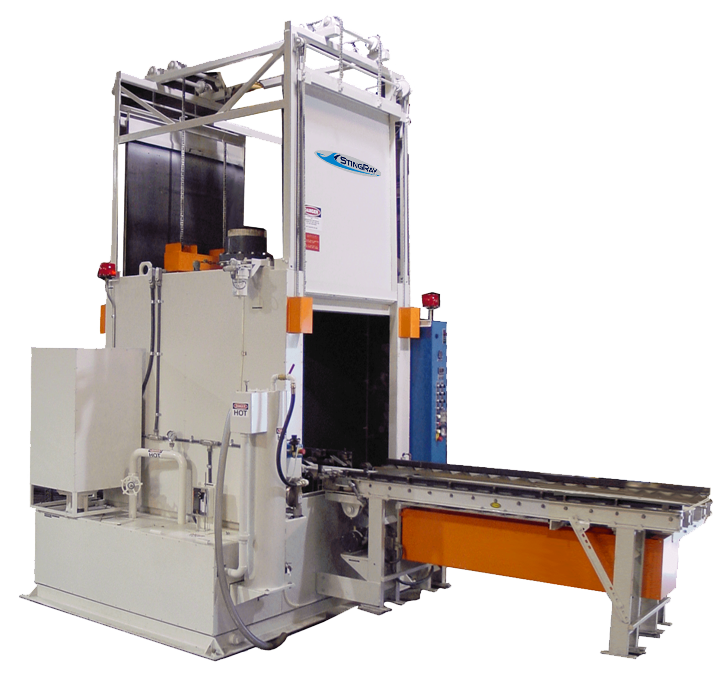 Higher rated capacities increase the work that can be performed in the parts washer. Convenient panel mounted industrial control for easy rotation of the turntable during parts loading. Panel mounted hour meter maintains parts washer operating hours. Selectable output pressure of duplex equipped pumping systems. Panel mounted digital display tracks parts washer pump amp draw. All standard wetted components are stainless steel. Provides SPOT FREE rinses via a Reverse Osmosis membrane system removes hard water minerals. The StingRay AC variable speed drive provides optimum control of motor speed and torque for energy efficient wash pressure and flow control. Efficient Method to remove moisture with reduced pressures resulting in faster drying. Eliminate steam from your StingRay parts washer with the Automatic Steam Exhaust (ASE) system. Washes and rinses hollow diameter parts where the interior is not ready accessible to standard spray manifold arms. Two machines in one. A standard machine and a shorter ultra high impact machine. The Hot Air Blow Off (HABO) system speed dries parts. Speeds flash drying of parts at lower cost than Hot Air Blow Off with near equal results. The Pump Pressure Regulator allows the operator to adjust the pressure discharge from the wash nozzles. Provides the necessary changes to the parts washer to operate with the identical performance parameters as 60 Hertz. Parts washers for worldwide use. International Freight, Crating & VCI wrap. Choice of heating systems to fit your plant energy source. Oil Skimmer removes surface waste oils floating on the parts washer cleaning solution surface. The Sludge Scraper removes sludge, rocks, sand, soil and other solid wastes from the bottom of the parts washer reservoir. Filters all parts washer fluid before discharging through the wash nozzles. Separates waste oil from Parts Washer cleaning solution. The StingRay solution transfer pump is especially designed for transferring water-based liquids, fluids and solutions from the parts washer. Ideal pump for handling all parts washer solutions and for clean out of your industrial parts washer. Automated, efficient evaporation that greatly reduces waste water disposal costs. Reduces noise from pump motor. Add safety control to the parts washer for employee protection. Secondary Containment, industry best practice for preventing reportable spill. Simplifies placing smaller items on the parts washer turntable for cleaning. Positions parts for optimum cleaning improve rinsing, and drainage for best flash drying. A straightforward method of binding parts and baskets to the parts washer turntable for washing. 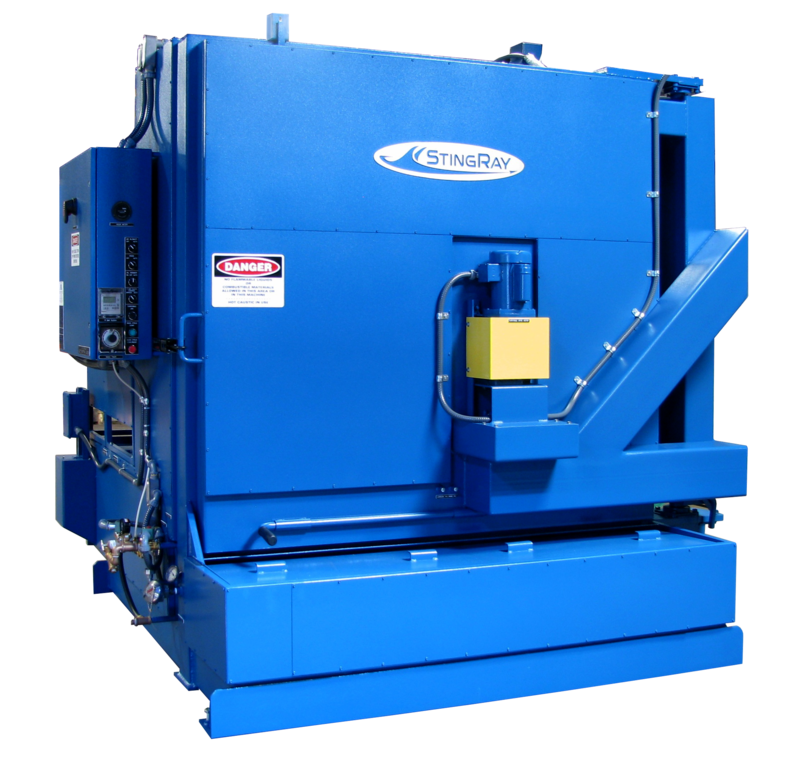 Provides a convenient loading means mounted to the parts washer. Provides an uncomplicated way to attach and properly position wash loads on the parts washer turntable. Provides a stable and even surface for loading parts. Lowers the height of the turntable to shop floor level for ease of loading & unloading. Saves Energy, lowers cost to heat machine. Reduces noise. Increases Safety, Conserves Energy and Improves Productivity. Properly sized pumps for the correct power density for the parts cleaning work save energy. Volume control of steam exhaust saves energy and maximizes wash temperature.